Argh! 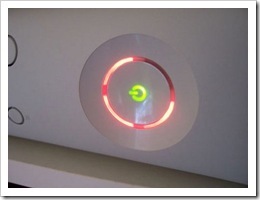 We turned on the Xbox 360 earlier, and what happened? So after approx 30 mins on hold to Xbox support, I finally get put through to a call centre where a helpful man takes down my details and registers a free repair. Whilst looking at the serial number label I took note of the manufacture date? 3rd December 2005! Today was my Xbox’s 3rd birthday! UPDATE 15th Dec: A brand new healthy Xbox landed on my doorstep this afternoon!